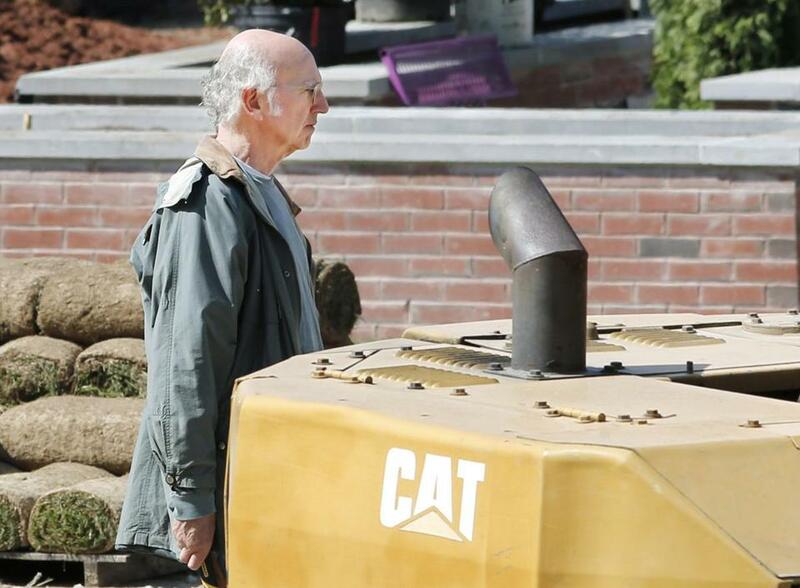 Larry David filming at a construction site in North Andover last month. as Nathan Flomm, a former marketing exec who lives in ­exile on an island off the coast of Massachusetts under the assumed name Rolly DaVore. He’s hiding to avoid humiliation after an argument with his boss led him to quit and ­surrender stock ­options now valued in the billions. as Rags, the friend of an eccentric quarry owner who agrees to help Flomm settle an old debt. as McKenzie, the foreman of an island construction project who hires Flomm, and soon afterward regrets it. as Will Haney, the founder of an ­electric car company who has a ­contentious relationship with Flomm, his former head of marketing. as Rhonda, the glamorous wife of Haney, with whom Flomm strikes up a special friendship. as Joe Stumpo, the eccentric operator of a quarry on the ­island. as Frank, an islander and Flomm’s best friend. as Jennifer, an ­islander who takes an off-handed suggestion from Flomm a bit too seriously. as Wendy, former girlfriend of Flomm, who he discovers has been hiding a secret since ­before they dated. as Jaspar, former boyfriend of a local girl who blames ­Rolly for the end of his relationship.